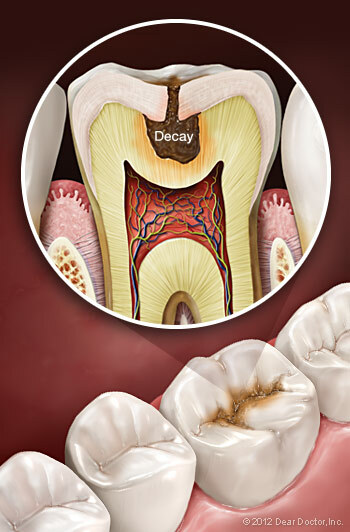 Tooth decay is often called the second most prevalent human disease, after the common cold. Without effective treatment (as was the case through most of history) it can lead to pain, tooth loss, and sometimes worse illnesses. Even today, it's estimated to affect over a quarter of U.S children from ages two to five, and half of those aged 12-15. But it doesn't necessarily have to! Working together with our office, you can take steps to prevent tooth decay from harming your teeth — or those of your loved ones. There's one important fact you should understand up front: No single “magic bullet” can stop tooth decay in every case. Instead, fighting decay should be viewed as a process of preventive maintenance, like taking care of your car — except that (unlike a car) your natural teeth, with proper care, can last a whole lifetime. The basic aspects of this process are practicing good oral hygiene at home, and coming in to our office for regular cleanings and checkups. If you've been coming in for routine visits, you're probably already familiar with the special tools we use to remove buildups of plaque (a bacterial biofilm) and tartar (a hardened deposit, also called calculus) from your teeth. We may use hand-held instruments, ultrasonic scalers, or both to give your teeth a thorough cleaning. Afterwards, we check thoroughly for decay, and treat cavities when necessary. Yet there's still more we can do to prevent tooth decay. Could your diet be a contributing factor? Is your brushing technique adequate? Could you benefit from additional preventive treatments? Today, with our increased understanding of what causes tooth decay and how to treat it, we can truly focus on decay prevention in your particular case. In fact, it's now possible to assess each individual's risk factors for decay, and concentrate on doing what's most effective for you. We think of the mouth as a dynamically balanced ecosystem, in which living organisms, including helpful and harmful bacteria, are constantly interacting. When conditions are right — namely, in the presence of certain sugars — some pathogenic (harmful) bacteria produce acids that cause teeth to lose minerals and begin breaking down. Even a diet having excessive acidic foods can influence deminerialization of your teeth. But in more favorable conditions, the damage these pathogens do is undone by the body's own healing mechanisms — which includes your healthy saliva. 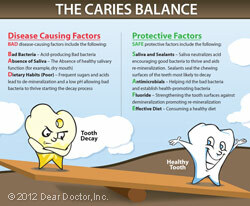 Our goal in decay prevention is to tip the balance in favor of the beneficial processes. Keeping up a regular habit of brushing and flossing, getting adequate fluoride, and a diet with limited acidic foods is certainly helpful. Yet even with these measures, some individuals will be more prone to tooth decay than others, and may need extra help and guidance. If you're one of these individuals, we can demonstrate effective brushing techniques and recommend other steps you can take at home, like using special tooth pastes or rinses. When necessary, in-office treatments such as topical fluoride applications are available. If you aren't getting enough fluoride through drinking water or other sources, this treatment can help prevent tooth decay. Anti-bacterial treatments may also be beneficial in some cases, as is nutritional counseling. 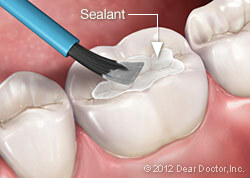 Finally, if your child's teeth are susceptible to tooth decay, we can apply a dental sealant. This is a practically invisible layer of plastic resin that is placed on the top (chewing) surfaces of the back teeth. It's a painless procedure that fills in the natural pits and folds of the tooth, making them much more resistant to bacterial damage. 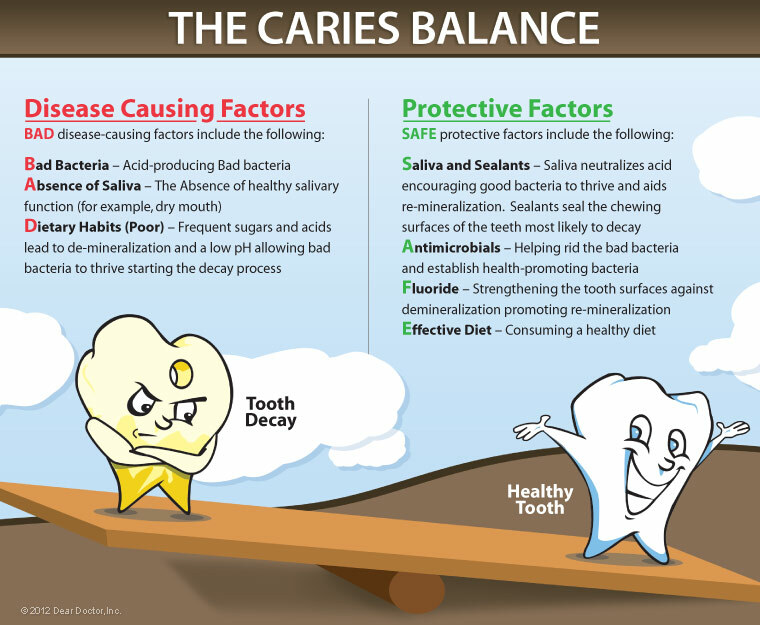 So, don't think that tooth decay is inevitable — instead, come in and ask us what we can do together to help prevent this disease from affecting you or your loved ones.